Home / A Comedy of Tenors / Greenbelt / Makati City / Play / Repertory Philippines / Review / Theater / Repertory Philippines: [JAN26-FEB18 2018] 'A Comedy of Tenors' at Greenbelt1 OnStage Theatre! 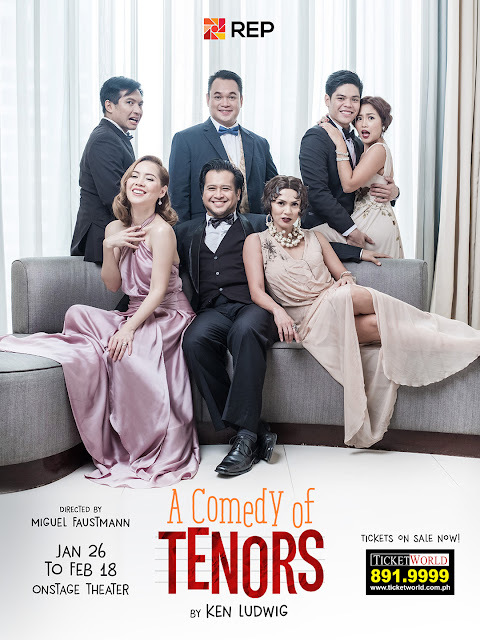 Repertory Philippines: [JAN26-FEB18 2018] 'A Comedy of Tenors' at Greenbelt1 OnStage Theatre! 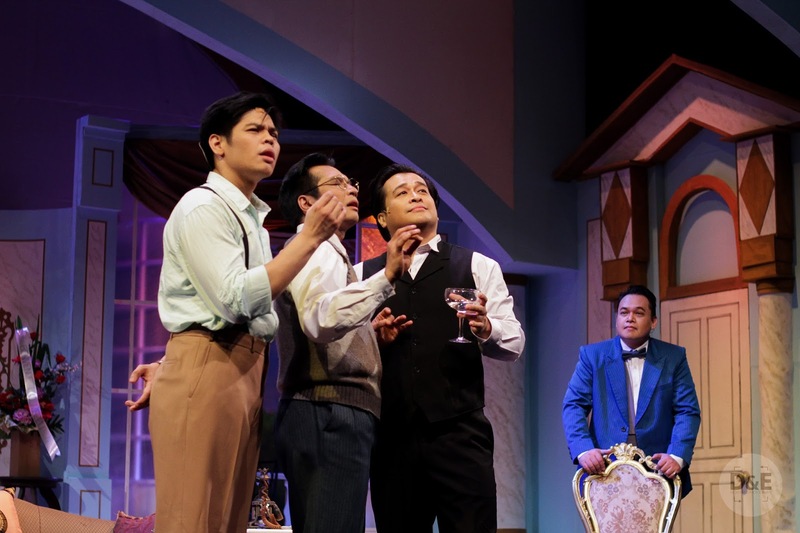 What a way to kickoff Repertory Philippines (REP) 2018 Season but with laughter and total entertainment through Tony Award-winning playwright Ken Ludwig's A Comedy of Tenors. The conflict, the chaos, all happened in Paris, 1936, in a hotel suite, hours before the much-awaited concert of three tenors: Max (Noel Rayos), the producer's assistant who is making his debut in opera; Carlo Nucci (Arman Ferrer), a rising opera star; and Tito Merelli (Loy Martinez), the greatest Italian tenor. 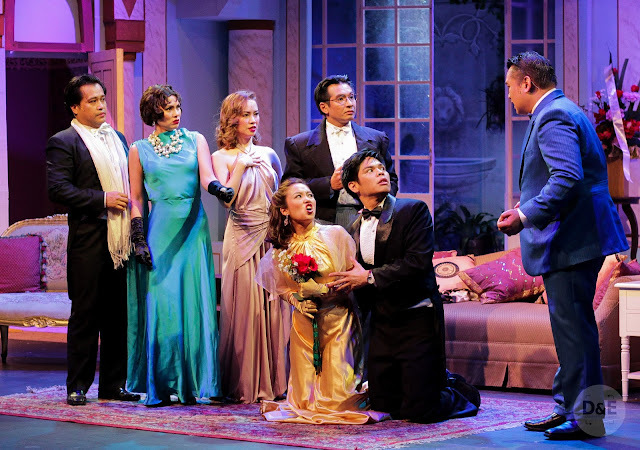 The on-off appearance of the main concert casts, love affairs -- or not, and chaotic misunderstandings, all brought the craziness in the plot. Oh, and insert Beppo, the bellhop, if the wackiness isn't enough. All the characters have their own quirkiness and personalities that are well-justified by the actors through voice accents and apt movements. 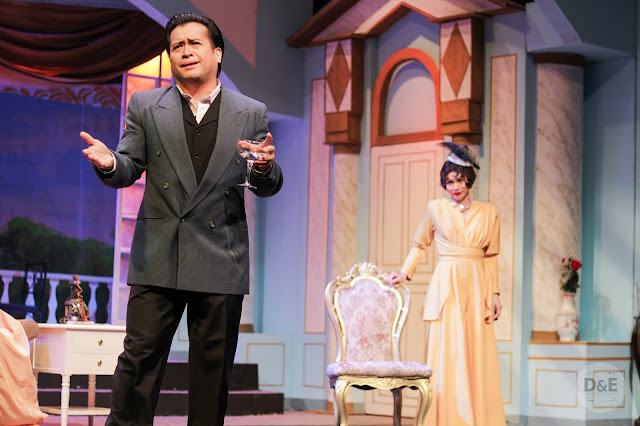 Loy Martinez's portrayals of Tito and Beppo are distinct -- the flawless transitions from one character to another, or from one side of the stage to another, making him really commendable. Plus, I got the most laughs from him, the way he cracks the lines, the expressions on his face, pure hilarity! 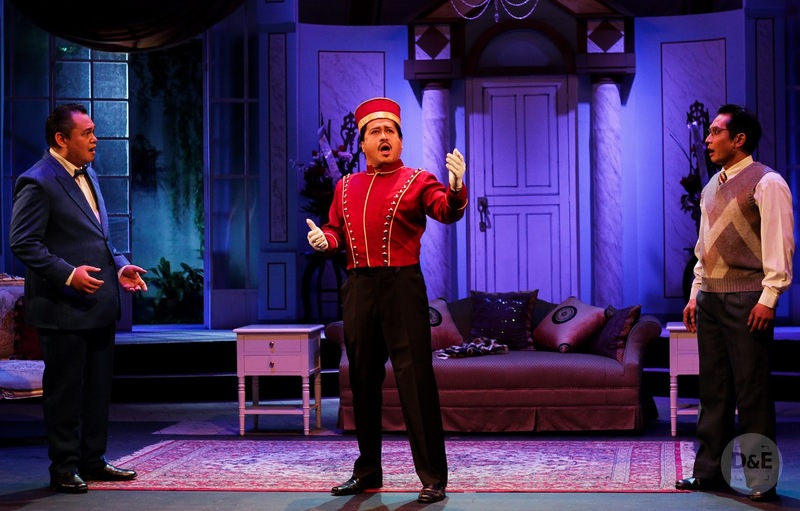 Another favorite character is Tito Merelli's wife, Maria Merelli, played by Issa Litton. Her explosive personality jived with the already-spirited turn of events. 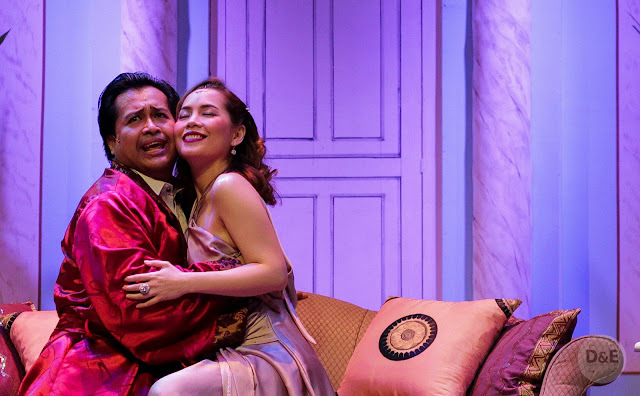 Other casts who spiced up the stage include Jeremy Domingo as the harassed concert producer Henry Saunders; Mica Pineda as Mimi, the drama queen daughter of Tito and Maria Merelli; and Shiela Valderrama-Martinez as Tatiana Racon, a famous Russian opera singer whom Tito used to have an affair with. Despite the comedy riot and the insane series of events, the story flow remained uncomplicated that you don't have to analyze things while watching. Your attention is effortlessly captured and you find yourself literally laughing out loud (LOL), or even rolling on floor laughing (ROFL) -- if that is possible. Two hours went so fast that you'd wish the play could have been extended because that kind of outrageous hilarity and entertainment is the pause we badly need at times. Kudos to the director and set designer, Miguel Faustmann, as even the stage setup is well-thought and designed. Intricate yet appropriate and aided the casts in their acts. A Comedy of Tenors will run from January 26 to February 18, 2018 at the OnStage Theater, Greenbelt 1. Call REP at 8433570 or Ticketworld at 8919999 for tickets. This hilarious play shouldn't be missed! Disclaimer: I was invited as a blogger to feature this show. I did not pay anything. Photos were provided by Buensalido PR. 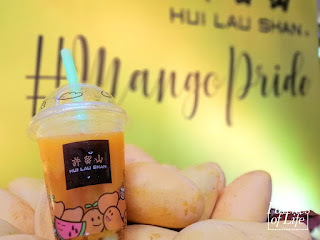 Bench Cafe: BENCH/TO, Bongalmusal, and more! Kenny Rogers Roasters: Chipotle Fire Chicken! Elait: Artisanal Rolled Ice Cream!